This book is the result of the extension and improvement of the article that, with the same title, was published in issue 38 of June 2017 of the digital journal BiD: textos universitaris de biblioteconomia i documentació. This expansion and improvement has consisted in the addition of new sections that complement and deepen the argumentation already expressed in the article, together with the inclusion of new bibliographical references, as well as the presence of an epilogue that, as a kind of philosophical and professional reflection, serves as a conclusion. In addition, a prologue has also been included, by the architect Josep Maria Miró i Gellida -responsible for the Nitidus studios- and who is the author of the future Provincial Public Library of Barcelona, which has yet to be built (and which is one of the oldest and most persistent demands of the librarian collective in Catalonia). 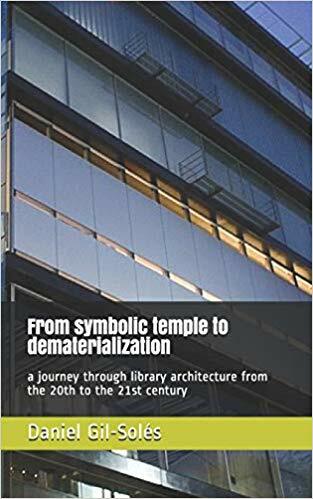 As with the publication of the article, the book also aims to establish an evolution in the architecture of libraries throughout the 20th and 21st centuries. This evolution highlights the different transformations that the library buildings have undergone, adapting to different forms, but above all to respond to the different social and cultural realities and also changing characteristics of each period and each historical moment. It proposes an evolution divided into 5 major architectural transformations. For each of these five transformations, one or more paradigmatic libraries from around the world are presented, clearly exemplifying the transformation to which reference is to be made. Each presentation is accompanied by an explanation of its main characteristics in terms of spaces and architecture, to finally argue this decision based on quotations from external sources and also with its own argumentation. It should be noted that quotations from other languages have been translated into Spanish. The result is a chronological and historical evolution that serves to frame and contextualize, ultimately, the fifth and final current transformation of libraries. The book also includes an extensive bibliography that should serve as a starting point for future and new studies on the subject. This book talks about the libraries of the Mancomunitat de Catalunya; of the Stockholm Public Library, the work of Erik Gunnar Asplund; from the Viipuri Library of Alvar Aalto; of the Exeter Library, work of Louis I. Kahn; of the Media Library of Sendai, work of Toyo Ito; from the University Library of Amsterdam, the work of Ira Koers and Roelof Mulders; from the Library of the Art University of Mushino de Sou Fujimoto, among many others.